Full Size Hype-Wipe® contains a 6 inch x 12 inch towel and enough pre-diluted 1:10 bleach solution to wipe down a 40 square foot area; Mini Hype-Wipe® contains a 3 inch x 3 inch towel and is great for cleaning / disinfecting blood glucose monitors, coagulation devices, small spills. Both are portable and convenient to carry in pockets. Stabilized for long shelf life with expiration date on each pouch and outer boxes for ease of management / inspection. Wipes contain bleach and detergent; registered as a one-step cleaner / disinfectant with the U.S. EPA and all states including those with stringent regs (CA, MASS, NY). Pre-mixed, ready-to-use, formulated at .525%, the 1:10 (5250 ppm) dilution of bleach recommended by the NCCLS, OSHA, CDC. 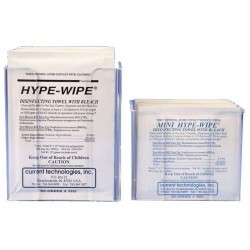 Our customers have been using Hype-Wipes® since 1996 – we often hear how much they love them and count on them for disinfection. For use on hard, non-porous surfaces including plastics, Plexiglas®, glass, ceramic tile, linoleum, enamel, floors and stainless steel (some manufacturers of equipment / surfaces, including stainless steel, require rinsing; follow those specific manufacturers’ instructions for cleaning / disinfecting / rinsing). For use on non-critical surfaces and items in clinical / research / industrial labs and hospital areas including ER, OR, ICU, radiology, nursing stations, patient rooms, clinics, dialysis and outpatient. Other sites include blood banks, physician and dental offices, ambulances, nursing homes, veterinarian facilities, wastewater facilities, restrooms, correctional centers, schools, health clubs. Often used for disinfection of blood glucose monitors, counters, outer sides of equipment, IV poles, bed railings, probes, blood pressure cuffs, slide prep areas, centrifuges, mammography equipment, carts, wheelchairs, gurneys, EMS backboards and phlebotomy trays.